During WWII, J.B. Mitchell Sirmans, of Ray City,GA. served as a crewman on the American armed merchantman SS Wheaton Victory. J.B. Mitchell Sirmans was a son of Jay Sirmans and Rachel Allifar Smith. In the post-WWII period J.B. Mitchell Sirmans made several Atlantic crossings as a crew member of the SS Wheaton Victory. The Wheaton Victory was one of 414 Victory ships built in 1944-45. According to the Pacific War Online Encyclopedia, the Victory Ships were an improvement on the Liberty Ships which were built earlier in the war. Men of Ray City, GA, like others across the nation, participated in the construction of these merchant vessels, and served aboard them. Another Ray City merchant marine, Hyman Hardeman Sirmans, served on the WWII Liberty Ships. By the time the Victory ships were being designed, it was clear the Allies were winning the war, so these ships were constructed to be of use for post-war commercial service. Construction standards were higher, and the Victory ships were safer and faster than the earlier Liberty Ships. They were also armed with general purpose and anti-aircraft deck guns. 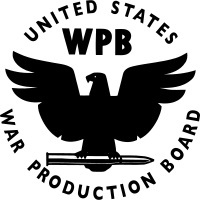 In 1942-45, WPB supervised the production of $183 billion worth of weapons and supplies, about 40% of the world output of munitions. Britain, the USSR and other allies produced an addition 30%, while the Axis produced only 30%. One fourth of the US output was warplanes; one fourth was warships. tonnage for a given investment of steel. The Controller of Shipbuilding on the War Production Board, William F. Gibbs, preferred to see construction of a single fast cargo ship. The Army and Navy were also interested in faster shipping for use as auxiliaries. The British had already begun construction of fast cargo ships and it was feared the U.S. merchant marine would be put at a considerable disadvantage in the postwar world. The debate over construction of Victory Ships vs Liberty Ships took long enough to resolve that the program was delayed by many months, and none of the Victory ships were completed before early 1944. 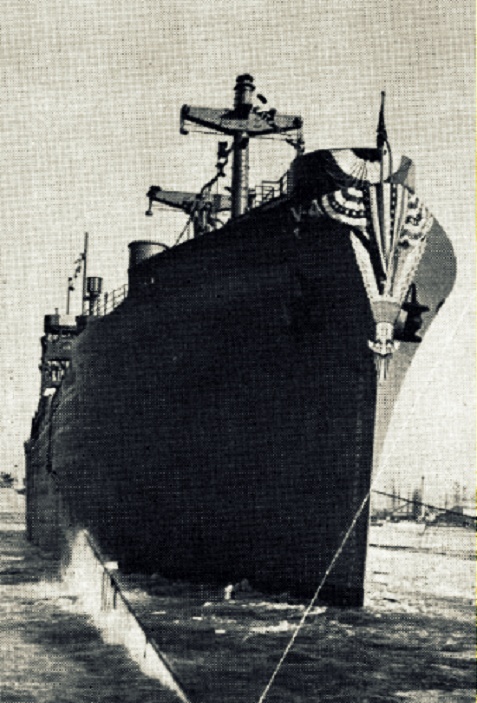 The Victory Ship design was largely based on the Liberty Ship, and design changes were deliberately kept to an absolute minimum to reduce the disruption in production. However, modifications were accepted to allow greater deck loads, and the cargo handling facilities were improved…. Decks for packaged goods were added. Because there was some uncertainty about the engines that would be available, the design made compromises to permit efficient operation over a range of powers. Because the ships were designed and constructed in wartime, virtually all were completed as armed merchantmen. The complement and armament shown are typically of those Victory Ships serving as armed merchantmen in forward areas of the Pacific. U.S. Customs Service records show Jay B Sirmans joined the merchant marines about 1942. He was 36 years old, 6’1″ and 160 pounds. In 1945-46 he was sailing on the S.S. Wheaton Victory as a Junior Engineer. At that time the Wheaton Victory was busily shuttling troops from Europe back to the States. 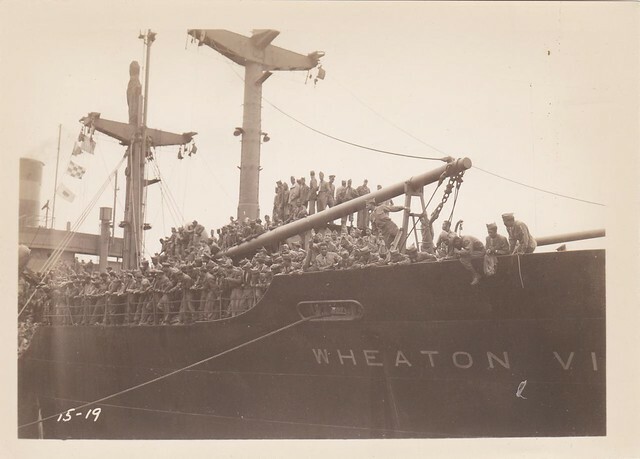 July 22, 1945 Wheaton Victory arrived at New York. November 25, 1945 Wheaton Victory arrived at Newport News, VA with 1,915 troops including chemical salvaged company; headquarters and headquarters company, 75th Infantry Division; 2nd battalion, 289th infantry; 3rd battalion, 289th infantry. December 27, 1945 Wheaton Victory arrived at Boston from Antwerp, Belgium with 1,544 troops including the 539th Field Artillery Observation Battalion with medics, 8th field artillery observation battalion with medics, and the 759th tank battalion with medics. January 26, 1946 Wheaton Victory arrived at New York from Le Havre, France with 1,518 troops including 602nd antiaircraft artillery battalion and the 196th general hospital. 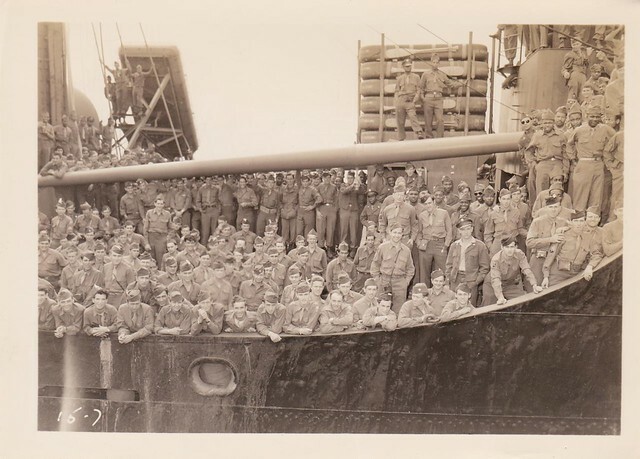 March 8, 1946 Wheaton Victory arrived at New York from Antwerp with 1,501 troops, including 559th anti-arcraft artillery Automatic Weapons Battalion and the 825th Medical Detachment. April 10, 1946 Wheaton Victory arrived at New York from Antwerp with 931 troops, including 465th and 958th Quarter Masters companies. 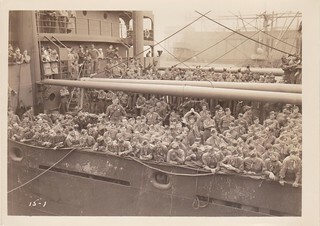 May 16, 1946 Wheaton Victory arrived at New York from Le Havre with 710 troops. 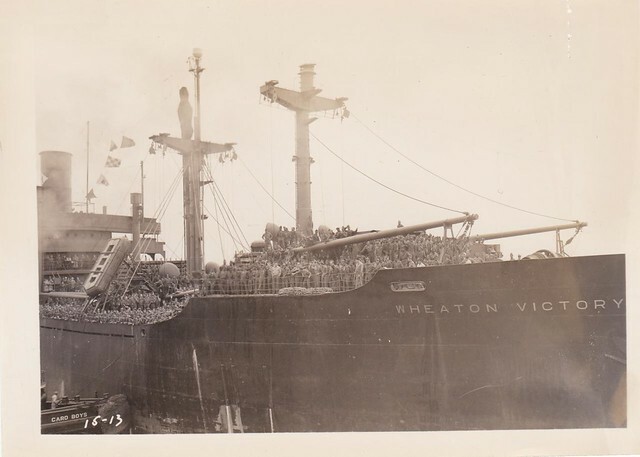 June 25th, 1946 Wheaton Victory arrived at New York from Bremen. 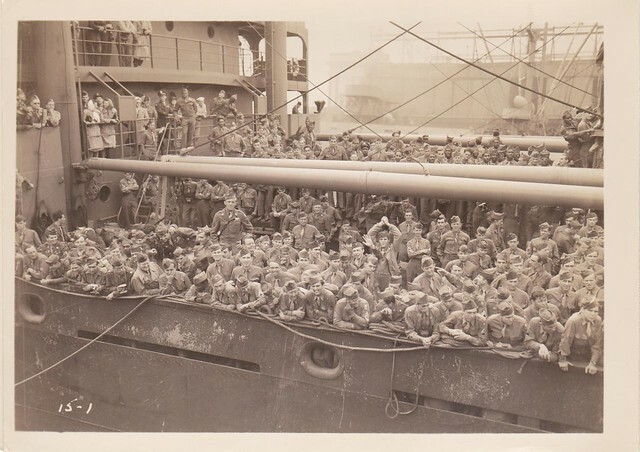 August 3, 1946 Wheaton Victory arrived at New York from Bremerhaven with 1,372 army troops. August 15, 1946 Wheaton Victory departed New York bound for the Panama Canal. The Wheaton Victory merchant marine ship in New York Harbor, August 3, 1946, full of American troops returning to the U.S.A. after World War II. The Wheaton Victory is being maneuvered into port by the tug Card Boys and other tugboats of Card Towing company. Image courtesy of Colin Smith. 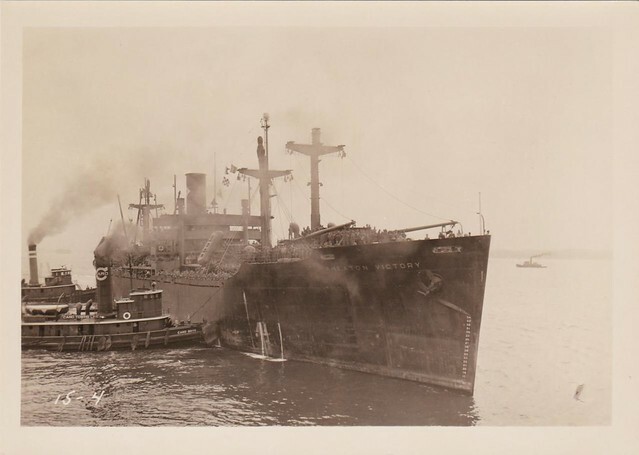 After the war, The Wheaton Victory merchant marine ship was pressed into service as a troop transport ferrying returning service personnel back to the States. The troops crowed the decks as the ship arrived at the docks in New York Harbor sometime in late July 1946 or early August 1946. In the crowd can be seen servicemen and officers, service women, and African American soldiers. Image courtesy of Colin Smith. 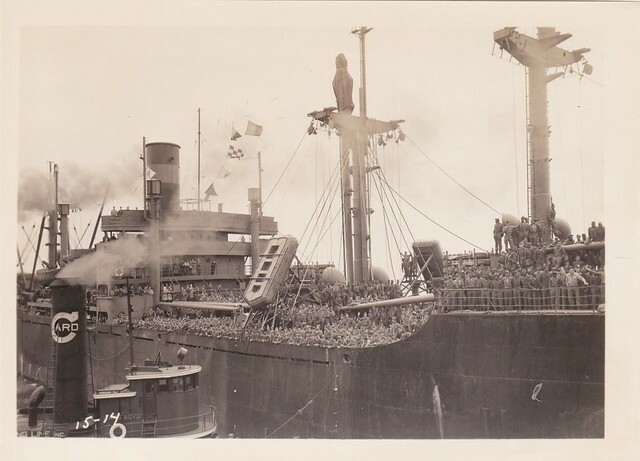 After the war, The Wheaton Victory merchant marine ship served as a troop transport, returning 900-1900 service personnel back to the States per trip. The troops lined the decks as the ship arrived at the docks in New York Harbor on August 2, 1946. Image courtesy of Colin Smith. Image courtesy of Colin Smith. 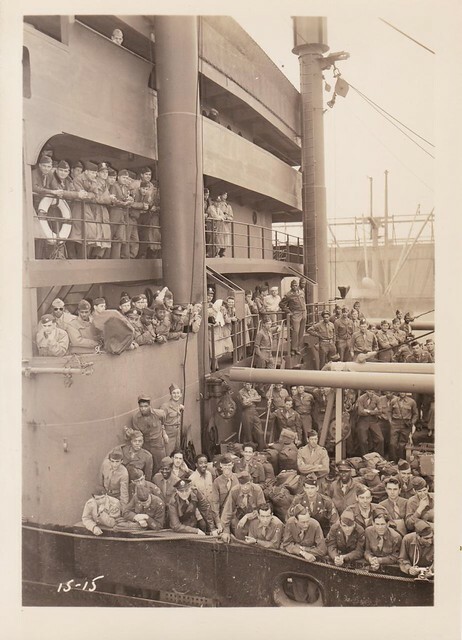 Wheaton Victory arriving at New York from Bremerhaven, Germany with 1,372 army troops on board. Image courtesy of Colin Smith. The Wheaton Victory merchant marine ship in New York Harbor, August 3, 1946, full of American troops returning to the U.S.A. after World War II. The bridge of the tug Card Boys, of Card Towing company, is seen in the foreground. Image courtesy of Colin Smith. The Merchant Marine served in World War II as a Military Auxiliary. Of the nearly quarter million volunteer merchant mariners who served during World War II, over 9,000 died. Merchant Sailors suffered a greater percentage of fatalities (3.9%) than any branch of the armed forces. Despite reaping the praise of both President Eisenhower and General Douglas McArthur following the war, many consider the men that served aboard these important vessels the forgotten Sailors of WWII, as those who returned home were denied benefits for injuries and often over-looked in Victory celebrations. In recent years, maritime and naval historians have begun to shed light on the significant contribution of the Liberty Ships [and Victory Ships] and their builders and Sailors. Their contribution to the war effort was tremendous–they were responsible for carrying 2/3 of all cargo leaving U.S. ports in support of the Allies over-seas. This achievement is matched by their contribution to the advancement of shipbuilding technology.